AMHERST, N.Y. – For the 11th consecutive year, Daemen College has been selected as a national College of Distinction in honor of the institution's excellence in undergraduate higher education. This also marks the second year Daemen has earned program-specific recognition in business, education, and nursing for the college's expert blending of the liberal arts with professional programming. "We are honored that Daemen has once again been recognized as among the best institutions in the nation," said Daemen President Gary Olson. "Daemen's long tradition of academic excellence and student success sets it apart as a true college of national distinction." 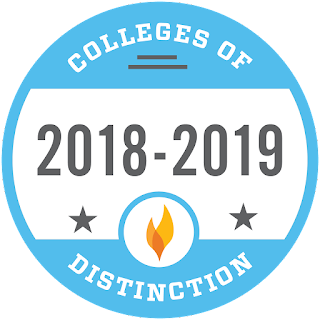 As a 2018-19 College of Distinction, Daemen has been recognized for excelling in student engagement, great teaching, creating a vibrant campus community, and successful outcomes, all areas considered key to an effective undergraduate education. Selection for the distinction is based on an institution's first-year student experience, retention efforts, general education programs, student satisfaction, alumni success, and other factors. To be designated a College of Distinction, a college's curriculum must emphasize such core competencies as critical thinking, writing, oral skills, research, and global perspectives. They must also offer dynamic out-of-classroom learning and study abroad programs." Colleges of Distinction seeks out colleges that are wholly focused on the student experience, constantly working to produce graduates who are prepared for a rapidly changing global society," said Tyson Schritter, chief operating officer for Colleges of Distinction. "Daemen's curriculum is enriched with high-impact educational practices that are most crucial for student development and for innovative engagement that prepares the next generation of young adults to thrive after college." According to Colleges of Distinction, best colleges like Daemen provide innovative, engaged experiences that prepare students for successful careers, active citizenship, and lifelong learning. Daemen was also cited with field of study distinctions in the areas of business, education, and nursing. These special honors in professional education were granted after a comprehensive vetting process, selecting colleges based on qualities such as accreditation, breadth of program, and a track record of success. Colleges of Distinction noted, "Today's job market is growing more complex every day, requiring the modern worker to be not only knowledgeable but also apt at communication and vigilant in the face of new challenges. Daemen's exhaustive curriculum has worked to meet these needs, preparing its students to take on the post-graduate world through an education that reaches far beyond the basics." · Business – The fast-paced, modern world of business requires effective communication and innovative strategies. Daemen keeps future leaders ahead of the curve and ready to grow alongside the industry. · Education – Daemen's future educators are exposed to varied real-world teaching experiences and are bolstered by an enriching liberal arts perspective that help program graduates to become empathetic, creative, and effective mentors for their students. · Nursing – Daemen's well-rounded perspective and vital clinical work experiences ensure students develop crucial skills that set nurses apart as compassionate and competent professionals who care deeply for their patients. Daemen's College of Distinction profile is available at collegesofdistinction.com/school/daemen-college/.